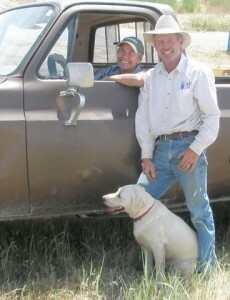 Tri and Nancy Robinson met on the College of Idaho campus in 1969. The first night they met they sat in the student union, drinking hot chocolate talking for hours about the kind of life they both wanted to one day live. They dreamed of living a unique life, a life of adventure, yet a simple life. A year later they were married and started the life they had dreamed of that has now been going on for nearly 40 years. After Tri graduated from graduate school they moved onto a rustic family ranch that eventually served five generations of Robinsons. They set up housekeeping in the winter in 1971 after packing their few belongings a quarter of a mile up the mountainside to their cabin in three feet of fresh snow. For the next fourteen years they lived without outside electricity and for the next five years without phone service. The cabin was supplied with spring fed water that Tri’s great-grandfather had piped down the canyon years before. For the next twenty years Robinson Canyon Ranch was their home. They experienced a rich life there giving birth and raising their two children Kate and Brook. Their life was isolated with the nearest town an hour away and their nearest neighbors a mile in one direction and five in the other.They learned to have a deep love for the land, for solitude, and for each other. For the first twelve years Tri was a secondary science and history teacher in Lancaster; the town that was an hour away. Living on the ranch was an educational experience teaching them about organic vegetable gardens, orchards and even developing a commercial pine tree nursery. They raised their own meat and learned to use horses in harness for cultivating and snaking firewood off the mountainside. Out of necessity they learned many skills concerning sustainable living. They learned to value the richness of community as neighbors gave each other helping hands in times of need. They learned to trust the miraculous hand of God in seasons of trouble and despair. The old ranch was a training ground for life; not just the life they lived in those days, but the life they were soon to live as they ventured back to Idaho in 1989. In the early eighty’s their family had the opportunity of working with a hill tribe people on the boarder of Thailand and Burma know as the Karen. The Karen people were undergoing ethnic cleansing from the Burmese national army. On seven different occasions Tri lived among them ( two of those trips he was able to bring the whole family) teaching English and bringing them the assurance of Gods love and concern for their plight. Their experience both challenged and altered their life focus which eventually led them to full time Christian ministry. Their hearts had become broken for a broken world and they began equipping young people on their ranch for oversees mission work. Eight years later through an extraordinary experience in the Idaho wilderness they made the difficult decision to leave the ranch and return to Idaho with a fresh vision to begin a new church. They had lived nearly twenty years on the old ranch and have now lived nearly another twenty years in Idaho. The church known as the Boise Vineyard flourished to nearly 3000 people and has stretched its arms out into its community and around the world caring for the poor and broken. Tri has authored three books concerning their adventures in ministry. Their experiences had been both rich and rewarding but through it all they never lost their love for the organic and sustainable lifestyle they had lived in those earlier years. In 2005 they purchased an 80 acre piece of raw rural land in the hills an hour out of Boise with the dream of building a new farmstead. That dream was realized in 2008 when they moved onto that land at the base of Timber Butte. They have posted this web site as a means of chronicling their experiences developing Timber Butte Ranch into a sustainable farmstead. It is their hope that these chronicles will serve as a means of education and encouragement to others who share a similar dream.